In 2019, the Visible Award returns to Europe to partner with Lafayette Anticipations in Paris. Besides the temporary parliament, the year-long collaboration with Lafayette Anticipations will be made up of two residencies with shortlisted projects from 2017, accompanied by a range of public events. The shortlisting phase followed a process started in June 2018, whereby 34 curators were invited to nominate up to 3 projects each. 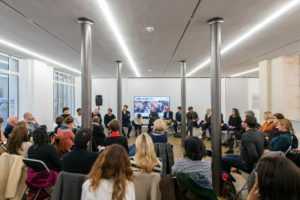 The curatorial advisory board, who finally nominated the long list of 67 projects, is made of esteemed colleagues – both affiliated with institutions and working independently in emerging or established scenes – who, for some, have previously collaborated with Visible. What connects them is a commitment to researching, supporting and offering discursive and productive platforms for innovative projects that are actively engaged within the social sphere. 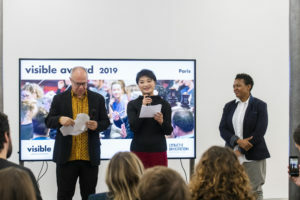 The announcement of the shortlist at Lafayette Anticipations was followed by a public discussion around the development of the 2019 Visible Award temporary parliament. As the last phase of the award, the temporary parliament is an event during which the recipient of the 25,000 euros award is decided after a day-long public debate. The 5th edition of the temporary parliament will take place in Paris in November 2019.